Join Dan and Tim as they kibitz on what they saw, heard, (and didn’t hear) at Oracle OpenWorld 2014. Just like last year, this session will feature Dan and Tim’s light-hearted take on Larry’s (is he going to still do the Sunday session since he’s not CEO?) big announcements and what it all means for the real world of Oracle BI, big data, and analytics. We’ll welcome questions, speculations, and alternative interpretations from other attendees. Space is limited. Reserve your spot. Brought to you by the BIWA SIG of the IOUG. See www.biwasummit.org for more information on BIWA Summit 2015 conference at Oracle HQ! 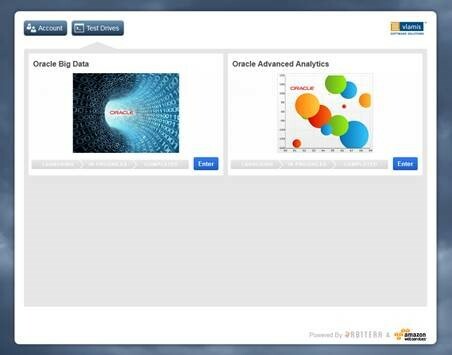 The OBIEE 11g Test Drive incorporates the newest version of SampleApp. With this new interface, you only need to register once for all of our test drives. In each case, we make Oracle content more accessible, allowing you to immediately use Oracle software with a dedicated virtual machine, alleviating the need to download a VM. There is a lot there, so you'll want to devote somewhere between 30 minutes and 3 hours to the test drive. We even have videos to watch that detail the process while you wait for your own private virtual machine to start up. You connect to your VM via a browser (BI), Windows Remote Desktop (OAA) or VNC (Big Data). You can get more information and spin up your own test drive at www.vlamis.com/td. By the way, these test drives have the full functionality of the virtual machines upon which they are built. So if you want to experiment with SampleApp, simply spin up a test drive. We do not limit what you do to a defined script. Go ahead and go off-road. Just don't expect us to send a tow truck to get you out of a ditch! If that happens, simply abandon the test drive and we'll recycle the bits for use by you or someone else next time. If you want more persistent or permanent access to a Test Drive environment let us know and we can arrange that too. We at Vlamis Software Solutions, Inc. have been working hard to give you some updates to Vlamis' Oracle Test Drive program, and we wanted to let you briefly know about them. As a reminder, our test drives run with the actual Oracle software running on the Amazon Web Services EC2 environment. They give you hands-on experience with the software and a tour of the features. If, after registration, you need additional time or need further instructions, simply send an email to testdrive@vlamis.com and we would be glad to help you. First, we are offering Oracle's new Big Data test drive, which is made up of five individual hands on labs that explore both Big Data and NoSQL Access to the Oracle Database. The data used is from Oracle Big Data Lite's MoviePlex. You can sample and see the inner workings of a movie streaming company. Second, the Oracle Advanced Analytics test drive is now using Oracle R version 1.4 as well as SQL Developer 4.0. In addition, both the Advanced Analytics and Big Data test drives are using Amazon Web Services’ new test drive launch platform, version 3.0. The new launch process is more user friendly. Once a test drive is launched, there is a video as well as written instruction that takes you through the start-up process, typically taking no longer than ten minutes. Lastly, we are in the process of migrating our OBIEE and Map Viewer test drives to Amazon’s new platform, and when they move, they will also be migrating to the newly released SampleApp 406. These changes are rapidly approaching, so stay tuned! In the meantime, you can still access both of test drives in their current version. 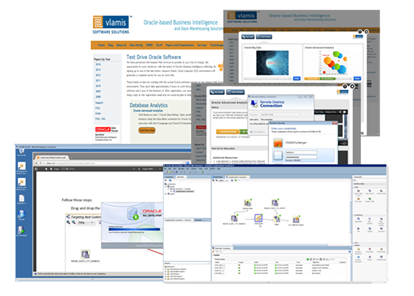 Thank you for allowing Vlamis to be your Oracle test drive resource! We appreciate your support. Vlamis Software Solutions, Inc. is an independent consulting company and is not affiliated with Oracle, Microsoft, or other entities mentioned on this web site, except as noted. Oracle and Express are trademarks of Oracle Corporation; Microsoft and SQLServer are Trademarks of Microsoft Corporation; all other products are trademarks of their respective owners. Vlamis Software Solutions, Inc. provides this material "as is" and makes no warranty or representation as to the quality or accuracy of the content of this web site.